Lily Bailey is a British model and now an author. At the age of 23 she is young to have written a memoir, but she has lived all of her remembered life with obsessive thoughts and performing rituals, so she is able to give an account of childhood OCD that hasn't been done in such detail. But her story is so particular to her that it seems unlikely that it is generalizable to other young people. For about the first half of the book she refers to herself as "we" because she is in constant dialog with a kind of imaginary friend -- she doesn't really explain what the duality is. Sometimes it sounds like her "friend" is a sort of superego, urging her to perform rituals and worry about the bad things she has done. The rituals are a result of a kind of magical thinking, with the hope that performing them will absolve her of guilt. At other times, her "friend" is more of a companion, keeping her entertained, giving her a conversational partner. This part of experience seems very unusual, and makes one wonder whether it's a sort of dissociation. At other points of her life, when she is self-harming and dangerous to herself, her condition seems more than just OCD. In the unabridged audiobook, Bailey herself reads her memoir, and does so with much more energy and drama than most authors can normally manage when reading their own books. She is especially good at conveying her own rituals, which involve much more internal thinking than outward behavior such as handwashing or checking. Bailey has a system of labeling her bad behavior with letters and saying long sequences of letters to herself, often in sequences that have to be repeated three times in order to work, and of course if she makes a mistake or is interrupted she has to start all over again. So she spends a great deal of time just talking to herself in order to complete her rituals. The arc of the story is straightforward. Bailey starts her life in a relatively wealthy family but her parents' marriage is very unhappy and this creates stress at home. She eventually goes to boarding school and she copes well there making friends and doing well in her studies. She slowly comes to realize that her behavior is unusual and is causing her problems, and she seeks out help. She gets an OCD diagnosis and gets cognitive behavioral treatment, which helps but does not completely solve the problem. When she gives up treatment after school she first copes well but then when she is in a foreign city, drinking too much and away from her old network of support, she goes badly off the rails. She goes through a hospitalization which helps to stabilize her but is largely a waste of time and money. Eventually she gets the help she needs and she does much better. This is a short book, less than 6 hours in the audiobook performance, and it goes swiftly. Bailey is a charismatic author with a distinctive reading voice, so it is an enjoyable read. This is quite an achievement because it can be very difficult to read about self-defeating behavior without becoming exasperated. 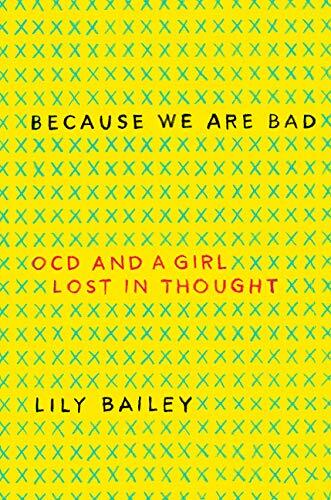 Because We Are Bad helps the reader imagine what it is like to be in Bailey's head and go through those problems.